Whether you are bird watching for a few nice photographs, or you’re an avid hunter, having a high-quality set of compact binoculars in your range bag is almost essential. There are at least 20 really decent sets of binoculars on the market that I could tell you about. 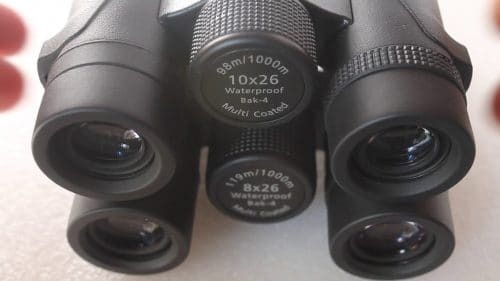 But, to help you with some of the legwork and making a better, more informed decision, I have thrown together a review of what I believe to be the 4 best compact binoculars available. In this review, I will talk a little bit about the features of each set, and weigh out their pros and cons. Then, at the end of the article, I’ll be giving you some advice about what you should consider before you buy your first or next set of binoculars. Pair this information together, and by the time you get done reading this article, you’ll know not only what features to look for and how they are used, but also how to spot high-quality binoculars. So, if you’re ready to buy a pair of compact binoculars but don’t know where to start, let me help you narrow it down just a little. No review of compact binoculars or scopes would be complete without the mention of Bushnell. After all, this is a brand that has been a leader in the high-performance sports optics for the past 50 years. For this review, it just happens to be the Bushnell PowerView Compact Binoculars that has found its way to the top of the list. The PowerView is probably what most would consider being an entry-level set of binoculars. While they are indeed made to be affordable for entry-level users, they are also surprisingly well-built. 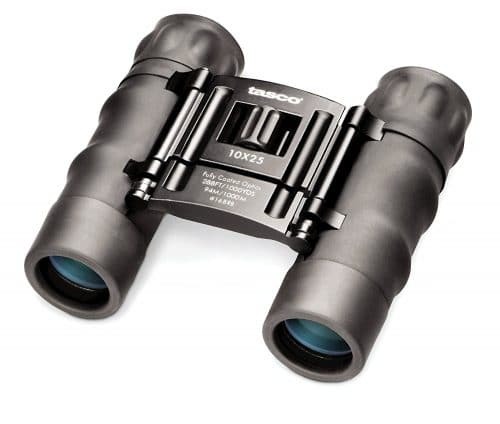 The first thing you may notice about these binoculars is that they are made to suit a contemporary style. More than that, the contemporary style actually lends itself to the overall function, as can be seen with its ability to fold in half (even the eyecups are foldable) to save just a little extra room in your tactical fanny pack. The BK-7 glass lenses are fully coated and contain the Roof Prism System to give you the brightest and most vivid images possible. The eyecups, apart from being able to be folded out of the way, are large enough to fit comfortably while not adding a lot of extra bulk. 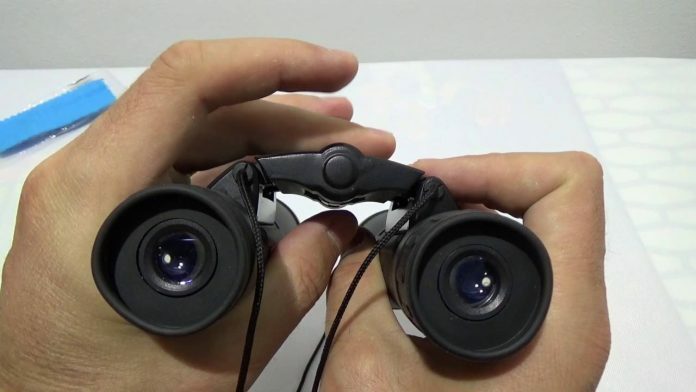 To protect your binoculars from shock from minimal drops, and to make sure you always have a firm grip on them, they make use of a non-slip rubber. If you are just getting started with bird watching or any kind of hunting and need a good pair of entry level binoculars before making a larger investment, you absolutely can not go wrong with the Bushnell PowerView Compact Binoculars. If you already have a set of the Bushnell PowerView binoculars, or you are just ready to take things to the next level, we recommend taking a peek at the Tasco Essentials 10×25 Compact Binoculars. I will start off by saying that these are one of my own personal go-to binoculars, and they have held up well over the time that I have owned them (roughly a year now). They are constructed exceptionally well, which is surprising because of the inexpensive price tag attached to them. The body is made completely of metal aside from the ergonomic and shock absorbing rubber handgrips and comfortable fold-down eyecups. Even the folding centerpiece is metal and holds up really well even after being folded down and opened back up time and time again. And the focal adjustment knob is just as smooth as some of the more expensive models out there right now. The lenses are fully coated and they utilize the roof prism system, which is perfect for giving you clear images in light conditions that are a little more on the bright side. Not to mention that they tout a field of view in the range of 288 feet at a distance of 1,000 yards. 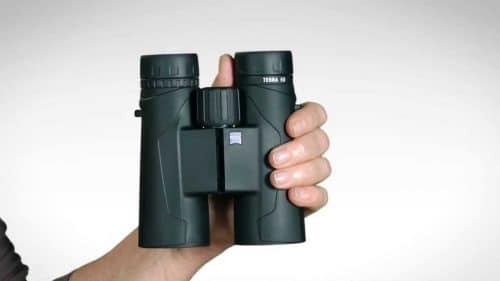 If you are moving beyond entry-level equipment, but still don’t have a small fortune to spend on compact binoculars, the Tasco Essentials 10×25 Compact Binoculars are an excellent choice. 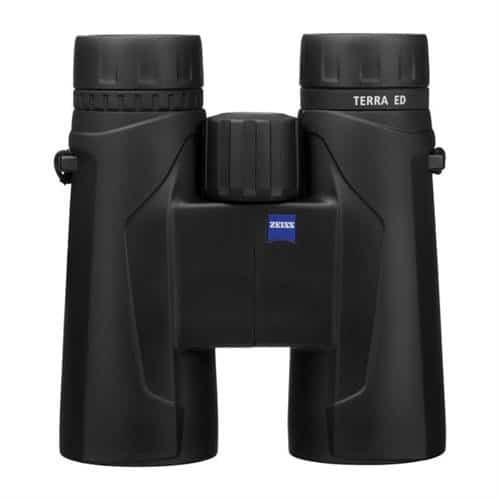 One of the most aesthetically pleasing sets of compact binoculars on our list is the Zeiss Terra ED. The casing on the Zeiss Terra ED is glass fiber reinforced to give you a watertight body that holds up well to the elements and carries a 100mbar water resistance rating. Interestingly enough, the durable casing is also extremely lightweight. Weighing in at only about 510 grams, this lightweight design is exactly what you want to see in a pair of compact binoculars. It provides just a little weight to keep your views stabilized but remains light enough to be carried around all day without weighing you down or wearing out your arms too quickly. On either side of the binoculars, you will find ergonomic rubber grips that make it easy to pick up your binoculars and get them to your eyes quickly so you never miss the chance to get a great view. As a matter of fact, the same material that has been used to create the comfortable, form-fitting eyecups is also used on the handgrips. The focus wheel moves smoothly and is tucked away nicely between the eyepieces. It’s easy to access and spin with one finger, but it also stays out of the way. The lenses onboard the Zeiss Terra ED utilize the Schmidt-Pechan prism system. 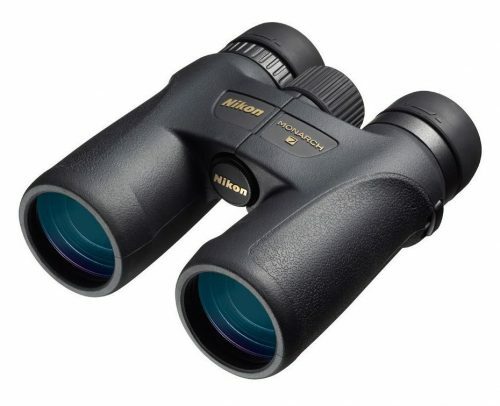 The precision this system provides, combined with hydrophobic multi-coated lenses is how these binoculars are able to deliver such stunning optical performance across a wide variety of conditions. Nikon is one of those companies that always strive to create some of the most innovative and high-quality products for the enjoyment of their customers. Best known for their cameras, Nikon also produces a wide range of excellently crafted compact binoculars, such as the Monarch 7. 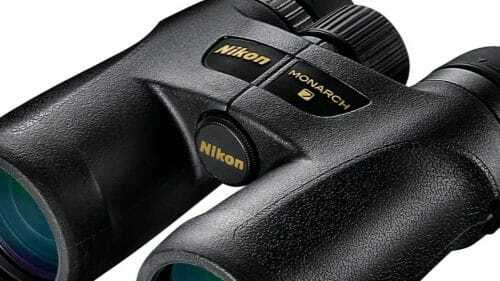 The Monarch 7 ATB is the most advanced optical system in any of Nikon’s other Monarch models to this day. The biggest upgrade to the Monarch 7 ATB is the type of glass being used in the lens. Past models used a normal glass, whereas the ATB utilizes Nikon’s ED (extra-low dispersion) glass that gives you a view that displays about as accurately as if you were looking at it with the naked eye. The colors always come out super crisp and accurate thanks to the Dielectric Multilayer Prism Coatings that Nikon applies to the lenses in the Monarch line of binoculars. Between the two multi-setting eyecups, you will find a focus knob. This central focus knob operates smoothly, taking very little pressure, but contains just enough resistance to make sure you can achieve the perfect level of magnification anytime you adjust it. 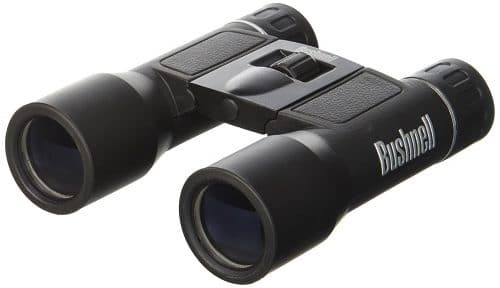 An ergonomic construction, innovative lenses, and a solid waterproof all-terrain body make these a prime choice for anyone who needs a pair of compact binoculars that are made to withstand rugged use. 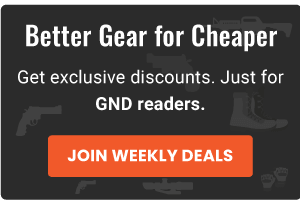 Don’t rush over to Amazon looking to dive into a huge catalog of all the latest and greatest compact binoculars just yet! While our review of the top 4 compact binoculars is surely enough to get you browsing around a bit, you may also want to consider the following things before making your final decision. You know those numbers that you see written on the sides or knobs of your binoculars. Like, 10×25, for instance. Well, those numbers actually give you some of the most important information about the binoculars. When you start shopping around for a new pair, these numbers become crucial in picking out exactly what you want and need. So, I’m going to teach you quickly how to interpret them. Let’s use our example of 10×25. The first number represents the magnification that the binoculars are capable of producing. In this case, the first number is 10x (yes, the x is part of the first number). This means that it can magnify images and make them appear ten times closer than if you were viewing it with the naked eye. This number may be something other than 10, but the same principle applies. The second number in this equation is 25mm. 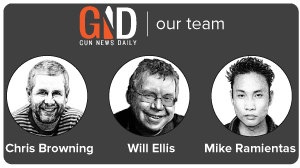 This number is what is known as aperture. The aperture number tells us the size of objective lenses that the binoculars contain. 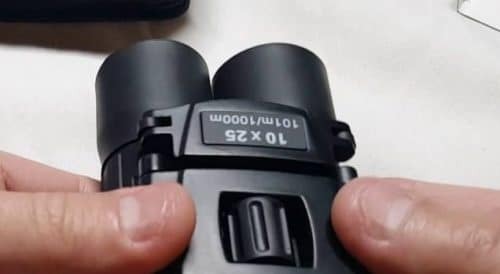 This is important to know because this number will tell you whether the binoculars are best suited for high-level or low-level light conditions. Basically, the higher the aperture number, the more light it is going to be able to gather. So, for birdwatching or even hunting on a bright sunny day, 25mm-35mm aperture is perfectly fine. If you are going to be stargazing or hunting at night, however, you may want to look in the 42mm-50mm range. One thing to note also is that the larger the lenses, the heavier your binoculars are going to be. When you buy a set of binoculars, one of the most important factors that you need to consider is the magnification. The higher the magnification number, the farther you will be able to see, and vice versa. Going with the highest number available isn’t always the best idea, however. Having a high rate of magnification means that you will have a more narrow field of view, as well. In general, a good magnification for general use falls somewhere between 8x and 12x. You can buy binoculars and scopes that are much more powerful than that, but you will probably want to consider purchasing a tripod to stabilize them. Do all of the features worked as advertised? Are they easy to use? What is the body constructed from? Would it be able to withstand a few falls? Is the eye relief comfortable? Any type of tactical equipment that you carry with you on an excursion into the wild needs to be able to withstand anything you put it through while still giving you peak performance. The answers to all of these questions will help you determine if the compact binoculars that you are looking at potentially buying are going to do their job, and most importantly, if they will do it well. If you are going to be using your binoculars frequently, do yourself a favor and make sure that you get one of the more lightweight sets. If you have to lift a pair of heavy binoculars numerous times while hunting or bird watching, you are going to be very sore by the end of the trip. Any gear that you add to your load is going to increase the weight you are having to carry around all day. To make it easy, you may even want to think about picking yourself up a tactical backpack. Ultimately, the best binoculars are simply the ones that do exactly what you need them to do and they do it well. Take the reviews and all of the advice here and apply it to your own search. If you own a pair of compact binoculars that you are obsessed with, let us know why in the comments section below.